Anatomic structure of different lupin species was studied by a number of researchers. Some scraps of information can be found in the monographs of Metcalfe and Chalk (1950), and Maissurjan and Atabiekova (1974). Other authors studied the structure of plantlets (Compton, 1912), roots (Тен, 1973; Михайловская, 1960, 1968), stems (Ball, 1949; O’Neil, 1961; Tomaszewska, 1966), and petioles (Petit, 1887; Борисова, 1975). Petrova (Петрова, 1983) analyzed anatomic structure of leaves in one perennial and eight annual species of lupin from various centers of origin. The results of the study of physiological and anatomical features of leaves of L. аlbus and L. luteus are presented in the work of Latykova and Borisova (Латыковa and Борисовa, 1989). Watari (1934) described the path of conducting bunches in petioles of two species. The structure of nodes was investigated in annual and perennial species (Гуленкова, 1982), and the effect of cotyledon and leaf traces on the development of conducting systems in plantlets was described (Денисова and Дмитриева, 1980). Some of the authors wrote about the structure of vegetative and generative organs of lupin when studying the variability of characters in this genus (Майсурян and Атабекова, 1974; Карпицкая et al., 1980). 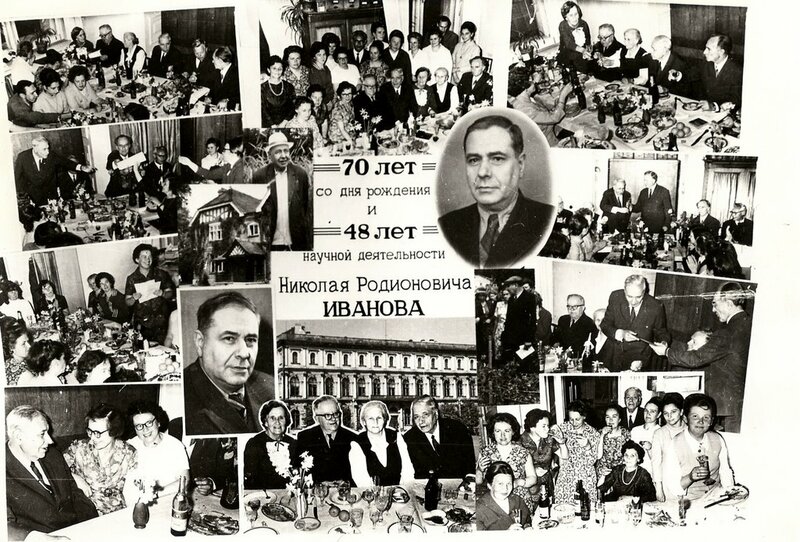 Great attention was focused on the structure of pods (Атабекова, 1958; Карпицкая and Таранухо, 1976; Белов and Лотова, 1991; Tomaszewska, 1954) and seed coat (Михайлова, 1958; Циклаури, 1962; Карпицкая and Таранухо, 1974; Редькина, 1976, 1979; Лотова, 1991; Zimmermann, 1936a, b; Heyn and Herrnstadt, 1977). Root. The root of lupin in its primary structure consists of the epidermis, primary cortex and central cylinder formed by the pericycle, xylem, phloem and parenchyma. The root is covered from outside by the epidermis forming root hairs, which are short-lived and quickly die off. The greatest area is occupied by the parenchyma of the cortex, consisting of thin-walled live cells different in shape and size. The internal layer of the primary cortex is the epidermis which differs from all other cells of the cortex by its shape and by its small and tightly serried cells. Not only one-layered endoderm was found in the genus Lupinus L., but also two-layered (L. angustifolius), three-layered (L. albus) and tetra-layered endoderm (L. luteus) (Тен, 1973). The pericycle is the outside layer of the central cylinder. It consists of one-layered densely located cells with thin parenchymal cell walls. The number of the rows of cells in this tissue is increased in front of the rays of the xylem, and there are lateral roots. The root system of annual lupin species has a diarchic structure. The arrangement of lateral radicles in lupin has two-rowed layout. The first root vessels are annulate and spiral. The larger vessels of a porous type are differentiated closer to the center and in the central part of a root. There are the groups of phloem between the rays of the xylem. Transition to the secondary structure begins when the cambium is formed between protoxylem and protophloem as a result of division of the procambium. It forms the outside elements of secondary phloem and elements of secondary xylem inside. Cambium forms a wide continuous ring in the root of secondary structure. The root of lupin has a xylem type of structure, i.e. it has more xylem in comparison with phloem. The secondary xylem of the root consists of vessels, libriform fiber, parenchyma and radial rays. The vessels are basically porous in the secondary xylem. They are surrounded with fibers of libriform shape and cells of ligneous parenchyma. The radial rays are primary and secondary. The number of primary rays corresponds to the number of rays of the primary xylem. Both primary radial rays proceed from the primary xylem located in the center of the root. They connect the central part of the root with the cortex. They are wide and consist of several rows of parenchymal cells of various shapes. The secondary rays are shorter and narrower. The continuous ring of phloem is situated outside of the cambium submitted by bast parenchyma, bast fibers, sieve tubes and cells - satellites. Intensive activity of the cambium causes growth of the central cylinder; therefore, there is a flattening of the cow part of the root and abscission of the primary cortex. Ten (Тен, 1973) has noticed that abscission of the primary cortex is partial in lupin; it is located in a zone positioned against the rays of the primary xylem. The root is covered by fuse and by secondary cortex lies. It is formed by cellular parenchyma, with groups of rather thick-walled and slightly lignescent bast fibers between its cells. The root of long-term miltifoliate lupin (L.polyphyllus) differs from the root of annual species by the presence of lignifying primary xylem. There are five primary radial rays in the root of this species. Secondary xylem consists of numerous layers of vessels formed with regular intervals. These layers are separated from one another by profuse homogenous tissue, often thin-walled and poorly lignescent. Considerably advanced ligneous parenchyma surrounds the vessels. The main root contains plenty live tissues of parenchyma in the secondary structure. They consist of ligneous and bast parenchyma and also of the cells of numerous radial rays of the root. A large number of long radial rays are formed in the root of perennial lupin during the first year of its life, and also short radial rays start their development. They become significantly longer only in the next year. The primary radial rays have greater length and width. In the second year and next years of lupin’s life, new short radial rays are set again. A series of radial rays are well discernible on a cross-section of an aged root, especially of its ligneous part. They are formed in different years of the life of the root. The rays of each year are always set at one level. This regularity in the formation of radial rays gets broken with the aging of a plant. It is connected with reduction of the cambium activity. The bast part of the root is solidly developed, especially in the roots of a young plant. Lignescent mechanical tissues are always present in the bast part, in addition to lignifying tubes and abundant bast parenchima. Mechanical tissues are set down in the periphery of the bast fiber in tangential layers interrupted by radial rays of the root. A certain periodicity is observed in the formation of fibrous mechanical tissues in the bast part of the root of an adult plant. It is considered that year-by-year growth of lupin roots proceeds with more difficulty as compared with other plants. It is necessary to take into account a number of anatomic characters while determining the age of a root. 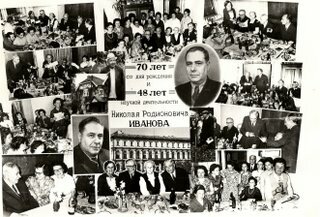 The study of the annual increment of bast tissue and the arrangement of narrow radial rays can help get an answer to this question (Михайловская, 1960, 1968). The cross section of two years root at L. pollyphyllus Lindl. There is an early developed cambium between phloem and xylem. Therefore, the primary structure of the root is very quickly replaced by the secondary in young plantlets. The cambium is active in the main root during its whole life. In view of this, the zone of cambium is large in adult plants. The activity of cambium decreases with aging of the plant and year-by-year gained layers become narrower. The primary cortex in perennial species of lupin dies off and falls in the first year of plant life. Only the secondary cortex remains surrounded by a layer of a cork. Stem. The stem of lupin has a dissimilar structure throughout all its length. In the top part of the stem, the conducting system consists of separate bunches divided by parenchyma. In the bottom part of the stem, the conducting system represents a continuous ring. The annual species of lupin differ from each other by the shape of the cross-section of the stem and by its size. In the basis, the stem of lupin is round, but at some species, such as L. albus and L. luteus, the sides are appreciable. The smallest size of the cross-section of the stem is found in L. truncatus andL. nanus, and the greatest in L. luteus and L. hartwegii. Considerable similarity is observed in the stem structure of the investigated annual lupins. They epidermis is single-row and is covered by thin wavy cuticle. Characteristic of the epidermis are stomas and simple acuminate hairs. There are 1-2 rows of collenchyma set under the epidermis. Behind them there is cortical parenchyma formed by 5-9 rows of roundish thin-walled cells. The first 1-3 rows of these cells have chloroplasts. On the sides of the stem there is a reinforced rim of collenchymal cells. Their presence makes the stems of lupin cultivars stronger and provides them with resistance to lodging. Fragility of the stem, characteristic of some species, for example L. subcarnosus and other species of the western hemisphere, is preconditioned by the lack of this mechanical tissue replaced in them by friable parenchyma (Майсурян and Атабекова, 1974). The cordial parenchyma comes to an end by the axis. Rather powerful rays of sclerenchyma are located behind it. The conducting system represents a continuous ring. Some species are characterized by very powerful xylem (L. angustifolius, L. mutabilis). 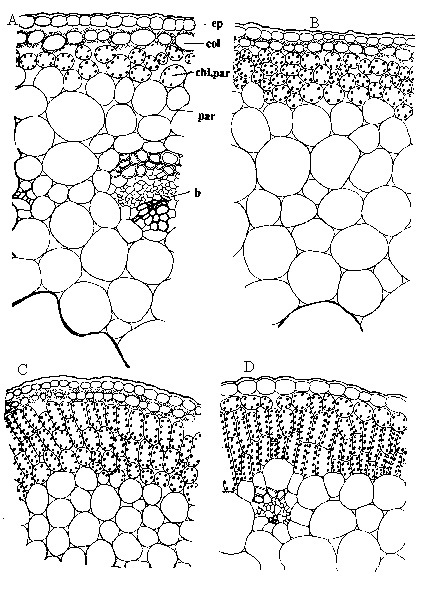 The cambium of 4-8 cell rows covers the xylem. A continuous ring of phloem is set at the external part of the cambium, above which there are rather powerful rays of sclerenchymal fibers. The medulla formed of rather large cells of parenchyma surrounds the internal cavity of the stem, which has different size in different species. The largest cavity is observed in L. cosentinii (up to 40% of the whole cross-section) and L. truncatus (53.3%), whereas the smallest is found in L. atlanticus and L. hartwegii (5.7 and 7.7 %). The cavity was not present in all studied accessions of L.angustifolius. The crystals are absent in all species of lupin. Thus, all examined annual lupin species differ from each other by the shape of the stem’s cross-section, outlines of the conducting cylinder, sizes of cells in different tissues, presence of collenchymal rims in the cortex, and percentage of various tissues. The stem of perennial L. polyphyllus has a round cross-section, sometimes with a small protuberance. One layer of collenchyma is located under the epidermis with cuticle and hairs. Farther behind it, a cortical parenchyma of 5-8 roundish thin-walled cells follows. The first one or two rows of these cells contain chloroplasts. The conducting system in this species represents a continuous ring, but the rays are well distinguishable. Sclerenchymal layer of 3-8 rows of cells are located above the phloem. Xylem and phloem occupy smaller area (about 10%) of the cross section in this perennial species as compared with the annual species, where xylem and phloem occupy from 16 up to 44%. The cambium consists from 4-5 layers in L. polyphyllus. The central part of the stem (up to 66-70%) is occupied by a large cavity. A – L.albus; B – L. angustifolius; C – L.truncаtus; D – L.polyphyllus. Maissurjan and Atabekova (1974) have noticed that the species of lupin from the eastern hemisphere are more large-celled than the species from the western hemisphere, where all plant components are smaller-celled. The largest cells are observed in the stems of the Mediterranean species, such as L. pilosus, L. albus, L. angustifolius and L. luteus. Of all species from the western hemisphere, a large-celled stem is reported only in L. mutabilis. Besides, all species from the western hemisphere differ from those from the eastern one by the presence of suberification in the bottom part of the stem. The nodes of the stem are ternary-lacunar and ternary-fascicular in all annual species of lupin. They are single-fascicular only in the area of the inflorescence. The node of the cotyledon is also single-lacunar or single-fascicular. Three rays go into one lacuna, of which two extreme rays are large and the middle ray is smaller in size, and no one of them has bast fibers. The last rays are often advanced poorly. The nodes of the cotyledons in perennial multifoliate lupin (L.рolyphyllus) are similar to those of annual species. However, nodes of vegetative burgeons are penta- lacunar and penta-fascicular. Besides, the numbers of rays and lacunae vary for different nodes (Гуленкова, 1981). Quite often it is possible to find nodes with six, seven or eight lacunae. One ray enters into each of the lacunas. The same author has reported that in the nodes of vegetative burgeons the minimal number of rays on the leaf trace is three. But usually the nodes have 5- or 7-fascicular rays. The number of rays, as a rule, corresponds to the number of lacunae. Leaf. The pubescence of lupin leaves is formed by simple, acuminate, three-celled hairs of various length. Pubescence is present on the bottom part of a leaf in all studied species, but it was mainly on the top in three species: L. atlanticus, L. luteus and L. nanus. In other species, individual hairs occur, or they are in general absent on the top epidermis of the leaf. The greatest number of hairs on the bottom surface of a leaf is presented at the Mediterranean species and at two American species (L.ornatus andL.mutabilis). The hairs are longer on the top of epidermis than on bottom. Long hairs are observed at the American species L.hartwegii and L.elegans and shortest at L.mutabilis, L.angustifolius and L.сosentinii (Tab. 12 in the book!). The least number of hairs is at L.polyphyllus. Sometimes they are absent and from time to time available individual hairs on top epidermis at this species. Some variation is marked in a degree of sinuosity of walls of epidermal cells (Fig. 11). Lower part of leaf (left) and upper part (right): A -L.angustifolius; B - L.albus; C – L.luteus; D – L.elegans; E –L.hartwegii; F - L.mutabilis, G - L.nanus; H - L.truncаtus. The walls of cells are twisting on both surfaces of a leaf. Exception isL.albus, L.atlanticus, L.cosentinii and L.mutabilis, at which the majority of cells are rectilinear-roundish on the top party of a leaf. The cells ofL.hartwegii are weakly twisting. By the most twisting outlines of cells differ L.truncatus and L.elegans. Distinctive feature of perennial lupins is the large number of fine cells and also largely wavy and zigzag walls of cells. At all species of lupin, especial at L.albus and L.polyphyllus, the coats of epidermal cells have thickenings. For epidermis of the leaf are characteristic usually anomocytic type of the stomas. They are settling down on both leaf surfaces. However, the stomas at perennial multifoliate lupin are available only on the bottom surface of a leaf. The smallest number of stomas is marked at L.angustifolius and greatest is atL.polyphyllus, L.atlanticus, L.cosentinii, L.albus and L.mutabilis on bottom epidermis. The number of stomas at L.luteus and L.angustifolius on the top surface of a leaf approximately is twice more, than on bottom; at L.elegans and L.hartwegii, on the contrary, the quantity of stomas on bottom epidermis is more than on the top. The number of stomas at other species is approximately identical on both parties of a leaf. In greatest length of stomas differ L.angustifolius, L.elegans, L.hartwegii, L.ornatus and L.luteus. The thickness of the leaf plates varies from 179 up to 528 microns at all investigated species. The leafs are dorsoventral at L.luteus, L.albus, L.atlanticus, L.cosentinii, L.ornatus and L.elegans (Fig. 12). а – L.luteus; b - L.albus; c – L.angustifolius; d – L.elegans; g –L.truncаtus, h – L.mutabilis; i – L.polyphyllus. ep – epidermis, pal.t. – palisade tissue, sp.t. – spongy tissue. The number of lines of palisade tissue changed from 2 up to 3, and porous - from 3 up to 5. The cells of palisade tissue at L.luteus are rather wide, high and more serried in comparison with other species. The leaf is isolateral at others annual species. The most xeromorfous structure of leafs has only L.angustifolius among the investigated Mediterranean species. It has the highest palisade’s factor (81,8-83,7%). The palisade tissue is submitted by two - three lines of cells from the top party and by two - four lines with bottom. The spongy tissue is friable. 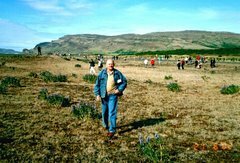 The highest palisade’s coefficient between American species is marked at L.hartwegii(86,5%) and L.mutabilis (81,4%). The palisade tissue consists from both parties of a leaf at them from two-three lines of short and wide cells with large intercellular spaces. 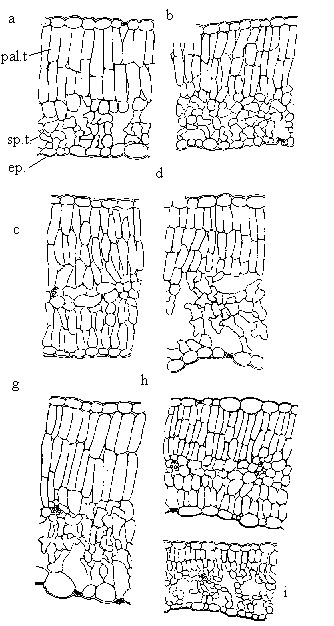 Three - four lines of short wide cells of palisade tissue from the top party of a leaf and two - three lines of narrower cells with large intercellular spaces with bottom are characteristic for L.nanus. The palisade tissue at L.truncatus is submitted from the top party of a leaf by two - three lines of high, basically wide and dense serried cells. This species has only one line of cells from the bottom party, which remind spongy tissue with very large intercellular spaces. The porous parenchyma is very friable and consists from four-five twisting cells. The palisade tissue at L.mutabilis consists from two-three lines of rather dense cells from the top party of a leaf, and from two shorter and more friable cells located with bottom. The palisade cells at L.micranthus are not dense from the bottom party of a leaf and have intercellular spaces. The leaf of perennial multifoliate lupin is very thin and has most mesomorphic structure in comparison with all investigated annual species. The palisade tissue consists from two lines of short cells. The second line has large intercellular spaces. The spongy tissue also consists from four-six lines. The lowest palisade’s factor is typical at this species. The middle vein is very similar at all species on anatomic structure. The orbed ledge is well excreted from the bottom party almost at all species . It is smoothed at L. angustifolius. There is one line of collenchimal cells in the ledge behind of epidermis. This line is swept poorly up at same species (L.angustifolius, L.truncatus). Some lines of orbed parenchymal cells are situated behind it. With the opposite parties from epidermal cells follow two-three lines of palisade cells with chloroplasts. The conducting system of the middle vein is formed by one vascular-fibrous beam located at the centre of vein. This beam consists from xylem, phloem and mechanical tissue. Last is submitted by collenchyma and sclerenchyma. The sclerenchyma is very weak and is present not at all species. Several cells at L.luteus, L.nanusand L.mutabilis submit it under phloem . It is frequently weakly lignescent at these species and it is absent absolutely at other species. Collenchyma is located from the party of xylem and limits phloem from two parties, sometimes incorporating under phloem by a thin line. The mechanical coat is absent completely at a conducting beam from the party of xylem at L.polyphyllus. The petiole of leafs differs on the size, form and anatomic structure at different species (Fig.13). f – L.hartwegii; g – L.nanus; h – L.truncаtus; i – L.polyphyllus. b – bundle, cav – cavity, lign. par – lignified parenchyma. They have the cylindrical form in cross section (at L.polyphyllus, L.hartwegii and L.mutabilis), ovate-triangular (at L.albus, L.truncatus, L.nanus and L.elegans) or weakly canaliculate (at L.angustifolius and L.luteus). Some variation is observed on the area of cross section, which depends from the sizes of leaf. The greatest area of cross section is observed at L.polyphyllus and least at L.angustifolius. Simple and acuminate hairs of various lengths cover the petiole at almost all species. All species of lupin, except for L.truncatus, have at leafs one line of collenchyma cells which follow behind epidermis (Fig. 14). а – L.albus; b - L.luteus; c – L.angustifolius; d – L.truncаtus. ep – epidermis, col – collenchyma, chl.par – chlorophyll-bearing parenchyma, par – parenchyma, b – bundle. Further medium-sized orbed cells with chloroplasts are located, which go on all circle of the petiole, obstructing only under a large beam. Number of their lines in this place is decreased. More deeply behind chlorophyllous tissue settles down some lines of large parenchymal thin-walled cells. Some differences are observed on number and form of chlorophyllous cells. So, at L.albus, L.elegans and L.polyphyllus this tissue consists from one, sometimes from two lines of orbed cells, and at L.luteus, L.nanus and L.mutabilis it consists from three-four lines. The part of chlorophyllous cells has the form of palisade cells (at L.angustifolius and L.truncatus). The chlorophyllous tissue of L.angustifolius consists from two or three lines of palisade cells, behind which follows one line of orbed cells. L.truncatus has one line of orbed cells at once for epidermis, and then two lines of palisade cells. Sometimes directly after epidermis settle down two-three lines of palisade cells. Large and fine beams form the conducting system of petiole. Some species have only three conducting beams (L.luteus and L.angustifolius), others have except for three large some more fine beams. There are many beams especially at perennial multifoliate lupin (8-10 large and 9-15 fine beams). The number of large beams reaches up to 5 at L.cosentinii and L.ornatus. It is many fine beams at L.truncatus (12-15). The beams are formed from xylem, phloem and sklerenchyma, which consist from two-four lines of cells. The xylem differs with size of vessels and degree of lignification of parenchymal cells. The xylem has almost not lignescent parenchyma at L.mutabilis and L.hartwegii . L.truncates and L.angustifolius on the contrary has strongly lignescent xylem. Large thin-walled parenchymal cells submit the central zone of the petiole. They partially break down forming a cavity. There is a large cavity atL.polyphyllus, L.truncatus, L.mutabilis, L.ornatus, L.micranthus and L.cosentinii at the centre of the petiole. But the cavity is absent at L.atlanticus and L.angustifolius. The anatomic study of a leafs at lupin has allowed to reveal the species with mesomorphfic and xeromorphic structure of this organs. The most mesomorphfic structure of leaf has perennial multifoliate lupin (L.polyphyllus). It has dorsovental type of structure, the large interrcellular cpace in mesophyll of leaf, very small palisade’s factor, large leaf plate and small thickness of leafs. Its stomas are only on the bottom party of a leaf. The presence of almost all listed attributes at L.albus, L.luteus, L.ornatus, L.cosentinii and L.elegans allows also relating these species to mesophits. 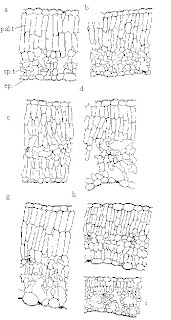 The structure of their leafs shows, that all these species, in particular L.polyphyllus, differ by the increased insistence to a moisture and less resistant to a drought. Other species also have an anatomic structure of a leaf characteristic for mesophytes, though they bear also some attributes of xeromorphity, such as isolateral structure of a leaf, well advanced palisade tissue, fine leaf, high percent of lignescent parenchyma in the xylem of petiole, chlorophyllous parenchyma in the petiole as palisade tissue. The most xeromorphic characters in a structure of a leaf differs differ among annual species L.angustifolius. It has small leafs with thick plates, isopalisadity, high palisade’s factor, high percent of lignescent parenchyma in the xylem of petiole, numerous narrow vessels and chlorophyllous parenchyma in the petiole as palisade tissue. All species with xeromorphic characters have at the same time large intercellular spaces not only as spongy tissue but also as palisade tissue. It can specify that they are resistant to the air drought but require to the soil moisture. Formation of them occurred probably in conditions of sufficient safety of moisture and plant was exposed to strong action of isolation. That, in opinion of a number of the researchers, results in a thickening of leaf plate and greater development of palisade tissue. So, as a result of study of physiological-anatomic features of assimilation at two species of lupin is established, that the large thickness of plate of leaf, palisade mesophil and epidermis, and also greater number of stomas and chloroplasts characterizes L.albus as more photophilios species in comparison with L.luteus (Латыкова and Борисова, 1989). Perennial multifoliate lupin differs from annual by absence of stomas on top epidermis of a leaf, by thin plate of leaf, structure of mesophil, low factor of palisadity, type of conducting system and large number of conducting bunches in the petiole. The research of 13 species has allowed to reveal, that such characters as number and distribution of stomas and the sizes of epidermal cells on both surfaces of a leaf, character of outline of epidermal cells, presence, number and length of hears, structure of mesophil, form of cross section of petiole, number of conducting bunches and structure of chlorophyllous tissue in the petiole can play an essential role in the systematic of the genus Lupinus L. (Майсурян and Атабекова, 1974). But, the analysis of the anatomic characters of separate species not given an opportunity to carry out precise border between Mediterranean and American subgenera of Lupinus L.
Bean. The pubescence of beans can be rare or on the contrary rather strong depending from a species. The hairs at bean are usually simple unicellular; at one species they are shorter and at others are longer. The valves of beans consist from outside epidermis, the layer of parenchyma, pergameneous layer and internal epidermis. The cells of outside epidermis are dense serried, slightly extended, with club-shaped by outside walls covered by cuticle. 1-3 lines of thickly walled hypodermic cells are located under epidermal cells at some species (L.mutabilis, L. hilarianus, L.succujentus) (Майсурян and Атабекова, 1974; Белов and Лотова, 1991). The parenchyma is formed by several lines of orbed or ovate thin-walled cells, behind which is situated the pergameneous layer, consisting from prosenchymal dense serried cells with thick lignescent boundaries. They are advanced poorly at one species and their thickness is rather significant at others. The walls of cells are covered by lengthened-ovate pinholes. The cells of internal epidermis, which are behind pergameneous layer, early collapse or keep in very small quantity. The deep drills pass lengthways of abdominal seam and middle vein at many species. The middle vein of a bean has one or two conducting bunch usually divided by one - two layers of thin-walled parenchymal cells. There are also two conducting bunches on abdominal seam of a bean, between which also settle down the parenchymal cells. There are two bands of sclerenchymal cells outside of conducting bunches from the party of abdominal seam and middle vein. Between them are situated not only thin-walled parenchymal cells but also clean collenchymal bands of the various sizes. The sclerenchymal bands are available at some species not only outside of conducting bunches but also from the inside, as at beans of L.mutabilis(Майсурян and Атабекова, 1974). The species of lupin differ from each other on anatomic structure of beans. There are species with easy shattering, non-shattering and weakly shattering beans both in the Mediterranean and in American groups. This ability is closely connected with an anatomic structure of a bean. The shattering of beans is provided by a number of the reasons: by presence of deep grooves lengthways of abdominal seam and middle nein, thick pergameneous layer, heterogeneity of tissues in area of abdominal seam and middle vein, formation of two layers of cells from the party of abdominal seam being as though continuation of cells of outside parenchyma, faltering sclerenchymal beams, absence of hypoderma under outside parenchyma etc. Such characters as absence or weak development of grooves lengthways of abdominal seam and middle nein, weaker development of pergameneous layer , presence of hypoderma from cells with club-shaped by cellulose bounady under outside epidermis, as at L.mutabilis, presence of continuous beam of sclerenchymal cells above conducting bunches, formation of cubepidermal collenchyma resist to shattering of pods. The direct bean is shattering usually more difficult than bent. 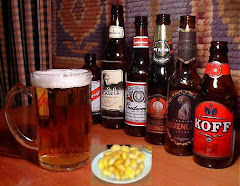 The reasons ensuring durability of beans at various species of lupin are not identical (Белов and Лотова, 1991). These authors noticed that by the same set of characters can be characterized both easily shattering beans and difficultly shattering beans. These writers consider that it is impossible to judge about presence of the precisely expressed tendency to easy or complicated shattering pods on the basis of separate anatomic characters . More important is a degree of reduction of pergameneous layer, which can be connected with features of submicroscopic structure of its cells and membranes. The character of changes in other cells of pericarp tissue at its drying also influences on this character. Other authors consider, that the significant role in the mechanism of shattering is played an arrangement of pinholes in the cells of pergameneous layer (Майсурян and Атабекова, 1974). The effective sources of non shattering pods at L. angustifolius were revealed by Gladstones (1967) at cv. New Zealand Вluе as natural mutants. This character is caused by two genes tardus (tа) and lentus (lе). The gene tа limits shattering for the account of accretion of beans valves by formation of solid beam of sclerenchymal cells on all perimeter of a bean. The gene lе reduces shattering at the expense of structural changes in the valves. The layer of dense pigmented tissue as a grid form inside them, which interferes a curling of valves. The valves of such beans get brightly expressed reddish shade to beginning of seed maturing. Seed. The outside layer of the seed coat is palisade epidermis covered by cuticle. The thickness of the cuticle may vary from one species to another. The palisade epidermis occupies the most part of the whole seed coat depth. It is formed by one row of cells having elongated shape. The size of the palisade epidermis is not the same with different species and correlates with the size of seed (Карпицкая and Таранухо, 1974). Thus, it is the smallest in L. nanus and the largest in L. pilosus and L. albus. The cavities of cells in the palisade epidermis are very narrow; sometimes, in some species, they are slightly extended in the middle part. The shape of their cross-section is 5-6-edged. The cells of this tissue contains barked matter and various pigments. Seed color depends on the distribution of the species. There are species (L. aridus, L. elegans and others) where some cells of the palisade layer are missing, and funnel-shaped channels are formed (Карпицкая and Таранухо, 1974; Лотова, 1991). The cuticle sags above these channels and the seed surface becomes rough. The palisade cells are crossed by one or two light lines of another cells. Under the palisade layer there is hypodermis formed of one row of club-shaped cells with more or less regular intervals, cells which look like sand-glass or coils. They are joined with each other by their ends leaving large intercellular spaces. The hypodermis has unequal thickness in various parts of seed. Fig. 15. The seed coat of L.angustifolius L.
1 – palisade epidermis; 2 – hypodermic tissue. Maissurjan and Atabekova (1974) considered that the structure and size of hypodermic cells in the seed coat of different species are variable and may be regarded as a proof of their specific character. 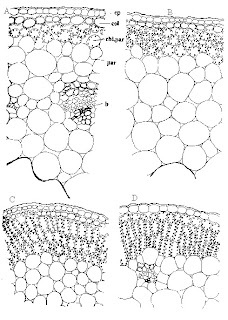 A thicker hypodermis and larger cells are observed in the seed of L. pilosus, L. digitatus, L. mutabilis, L. albococcineus and L. angustifolius (Карпицкая and Таранухо,1974). There are three layers of cells behind the hypodermic layer. The first is thick- walled parenchyma with cells filled by nutrient substance in unripe seed; the second is thin-walled parenchyma through which conductive bunches pass; the third layer is formed by strongly squeezed cells of thick-walled parenchyma. Maissurjan and Atabiekova (1974) reported that different species differ from one another in the structure of these layers, variable likeness, and unequal thickness. Another author (Лотова, 1991), on the contrary, stated that the variation of anatomic characters of the seed structure is very wide, and they have no diagnostic importance for the taxonomy of the genus Lupinus. Seed hardness characteristic of a majority of leguminous crops is found also in lupin species (Михайлова, 1958; Циклаури, 1964; Карпицкая and Таранухо, 1974; Редькина, 1976; Лотова, 1991). The thickness of palisade tissue in hard seed is greater than in normal swelling seed and makes about half of the whole thickness of seed coat. Such seed may be found in L. pilosus, L. digitatus and L. subcarnosus. In other species, palisade tissue occupies approximately one third of the thickness of seed coat (Карпицкая and Таранухо, 1974). The cells of the palisade layer of hard seed have thicker membrane and narrower cavities. It was found out (Лотовa, 1991) that the epidermis and hypodermis are the tissues determining seed hardness. An increase in the total thickness of these two tissues, if compared with the depth of all spermoderm, plays an important role in increasing the hardness of seed. The cells of the hypodermis in hard seed are densely linked with each other. It is considered that the pigments contained in the cells of the palisade epidermis, hypodermis and parenchymal layer render an effect on the permeability of seed coat as well (Редькина, 1976). The hilum is represented on Figure 16. There are two layers of palisade cells outside of the hilum: the first internal palisade layer is the rest of seed stalk, and the second internal layer is the continuation of palisade tissue of seed coat. Both layers are broken up forming the hilum cleft which is pressed in the tracheal islet consisting of cells of various length and with numerous pinholes looking like tracheids. Mesh tracheids are typical for L. luteus and L. pollyphyllus, ladder-like tracheids are typical for L. albus and spiral ones for L. pollyphyllus and spiral ones for L. elegans (Редькина, 1979). Hygroscopic properties of seed are regulated with the help of the hilum cleft. Under the palisade epidermis, on both sides of the tracheal island there is a hypodermic layer consisted of cells of various shapes: fusiform, cylindrical, etc. Significant part of the hilum is occupied by asterinoid tissue which adjoins hypodermis and consists of thick-walled cells of various shapes with broad intercellular intervals. The asterinoid tissue in some species (L.angustifolius and L. pollyphyllus) directly adjoins the tracheal islet, while in other species it also has a two- or three-layered thin-walled parenchyma which surrounds the tracheal islet. In asterinoid tissue cells there can be pigments, sometimes specific to a certain species. Adjacent to both asterinoid tissue areas is porous tissue made of thin-walled cells of various shapes. This tissue has large intercellular spaces in L. angustifolius, and is strongly condensed in L.polyphyllus (Редькина, 1979). There is a layer of extended, slanting and strongly obliterated cells below the porous and asterinoid tissues. These are the remnants of a nutritive layer that separated cotyledons and seed coat.